Kennebunkport is well known as a foodie place along Maine’s Southern Coast. 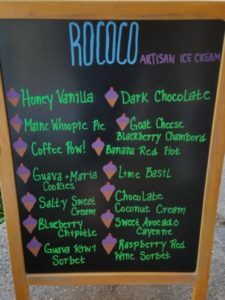 Rococo’s Ice Cream is another example of a small local food expert at their finest. There’s so many things we love about Rococo’s. Let’s start with the fact that it’s owned and operated by a local Maine girl named Lauren Guptill. Lauren had been living in Argentina, running another small business, when she fell in love with the Argentinian style of ice cream. Apparently, the ice cream there was introduced by Italian settlers and is closer to gelato than American hard scoop ice creams. It’s softer and creamier and absolutely delicious. Lauren moved back to Maine in 2012 and leased her store front in the busy Kennebunkport Dock Square neighborhood with the simple plan to make and sell her artisan ice creams from this little shop. She named it after a baroque style of architecture that is feminine and soft. Perfect for her new ice cream business. Using the freshest local ingredients she could find wherever possible, she started creating her many handcrafted ice creams in time for the busy summer season. That first summer was a huge hit and she hasn’t looked back since. Lauren and her team are more than happy to let you sample them to find the one (two, three…..) that you like. There’s something for kids too with more ‘sedate’ flavors like Honey Vanilla and Dark Chocolate. The flavors change daily so plenty to choose from if you want to stop in each day you’re in Kennebunkport to try a variety. You can have your ice cream in a bowl or on a regular or waffle cone. Gluten free cones are also available. Rococo has been such a success, she’s opened three more locations across Southern Maine. You can now find these yummy ice creams in her shop on Main Street in Ogunquit, Bob’s Clam Hut in Kittery and Brewsters Market in Kittery (offering eight flavors only). 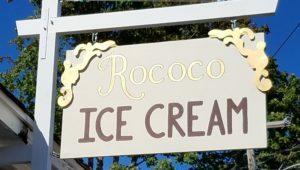 She was named in Goop’s (yes, that’s Gwyneth Paltrow’s website) Maine Road Trip Guide as a place to eat in the Kennebunks. The final thing we love about Rococo? You’re going to walk right by as you are walking to and from the 1802 House to Dock Square so it’s really easy to just stop in on your way! Rococo’s in Kennebunkport are open from May through Columbus Day 11:30am to 11:00pm.